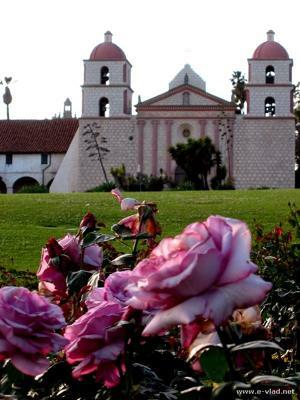 When I was a fourth grade teacher, I took my class to the Santa Barbara mission. We traveled to the mission because part of the fourth grade California social studies curriculum is to study California missions in connection with the Native Americans and how they were influenced religiously. At the same time, our class was also studying and reading the novel, "Island of the Blue Dolphins" by Scott O'Dell. This was significant because attending this beautiful mission near the ocean with one of the most extraordinary rose gardens had the grave of the main character of the story, Karana (secret name: Wanapalei) who was based upon a real girl. It also allowed the students to see what real mission life was like. Students were so excited to go to Santa Barbara because it was approximately 51 miles each way from the Newbury Park school location. They were able to experience so much at the mission and also were able to eat lunch near the rose garden. All around, an awesome field trip. Thank you for telling me about this! I live in L.A. but never heard of this mission. I'll have to take my kids there sometime! Join in and write your own page! It's easy to do. How? Simply click here to return to Field Trips.